Anyhow, Server Density previously used a pricing system much beloved by technical founders: highly configurable pricing. Why do geeks love this sort of pricing? Well, on the surface it appears to align price with customer success (bigger customers pay more money), it gives you the excuse to have really fun widgets on your pricing page, and it seems to offer low-cost entry options which then scale to the moon. 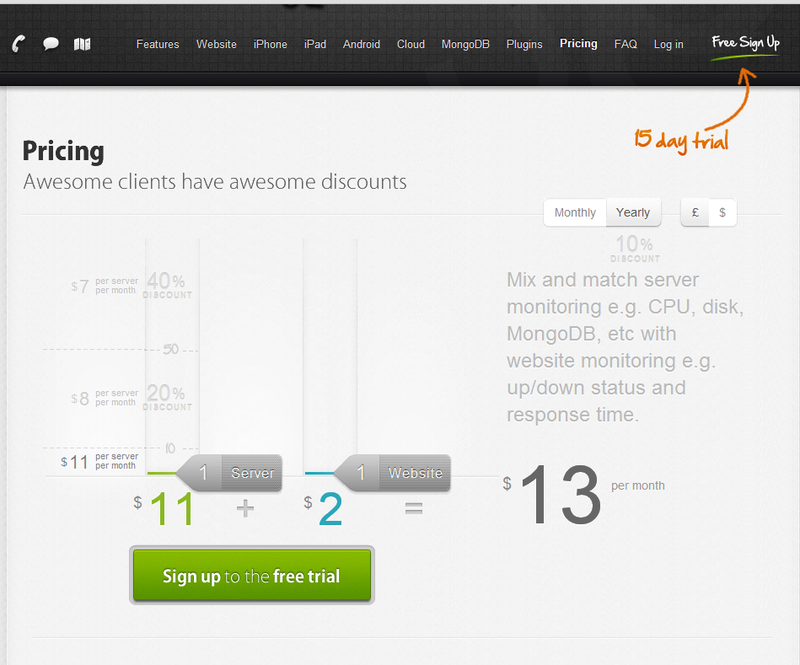 It costs $11 per server plus $2 per website. Except if you have more than 10 servers it costs $8 per server plus $2 per website. Except if you have more than 50 servers it costs $7 per server plus $2 per website. This is very complicated and does not align pricing with customer success. Why not? Dave at Server Density explained to me that their core, sweet-spot customer has approximately 7 servers, but that the per-server pricing was chosen to be cheap to brand-new single-server customers. They were very concerned with competing with free. Regardless of whether this wins additional $13 accounts, it clearly under-values the service for 7 server accounts, because their mission-critical server monitoring software in charge of paging the $10,000 a month on-call sysadmin to stop thousands of dollars of losses per minute only costs $79. You don’t get 7x the value from server monitoring if you increase your server fleet by 7x, you get (at least) 50x the value. After you get past hobby project you quickly get into the realms of a) serious revenue being directly dependent on the website, b) serious hard costs like fully-loaded developer salaries for doing suboptimal “cobble it together ourselves from monit scripts” solutions, and c) serious career/business reputational risks if things break. Let’s talk about those $13 accounts for a moment. Are $13 accounts for server monitoring likely to be experienced sysadmins doing meaningful work for businesses who will solve their own problems and pay without complaint every month? No, they’re going to be the worst possible pathological customers. They’ll be hobbyists. Their servers are going to break all the time. They’re going to misconfigure Server Density and then blame it for their server breaking all the time. They’ll complain that Server Density costs infinity percent more than OSS, because they value their own time at zero, not having to e.g. pay salaries or account for a budget or anything. Predictable pricing. You know that no matter what the sysadmins do this month, you’re likely to end up paying the same amount. Less decisions. Rather than needing to do capacity planning, gather data internally, and then use a custom-built web application to determine your pricing, you can just read the grid and make a decision in 30 seconds. More alignment with business goals. Unless you own a hosting company, “number of servers owned” is not a metric your CEO cares about. It only tends to weakly proxy revenue. Yes, in general, a company with 10 servers tends to have more commercial success than a company with 1 server, but there are plenty of single-server companies with 8 figures of revenue. The minimum buy-in for the service is now $99 a month, which will segment away customers who are less serious about their server uptime. You now only need to make one decision, rather than needing to know two numbers (which you might not have access to at many of their customers). The segmentation on users immediately triples the price for serious businesses using the service, irrespective of the size of their server fleet. This is good because serious businesses generate a lot of money no matter how many servers they have. Phone support will be an absolute requirement at many companies, and immediately pushes them into the $500 a month bucket. I still think it is underpriced at the top end. Then again I say that about everything. Did you notice the real Enterprise pricing? (Bottom right corner, titled “More than 100?”) Like many SaaS services, Server Density will quote you a custom plan if you have higher needs. Given that these customers are extraordinarily valuable to the business both for direct sales and for social proof, I might make this one a little more prominent. 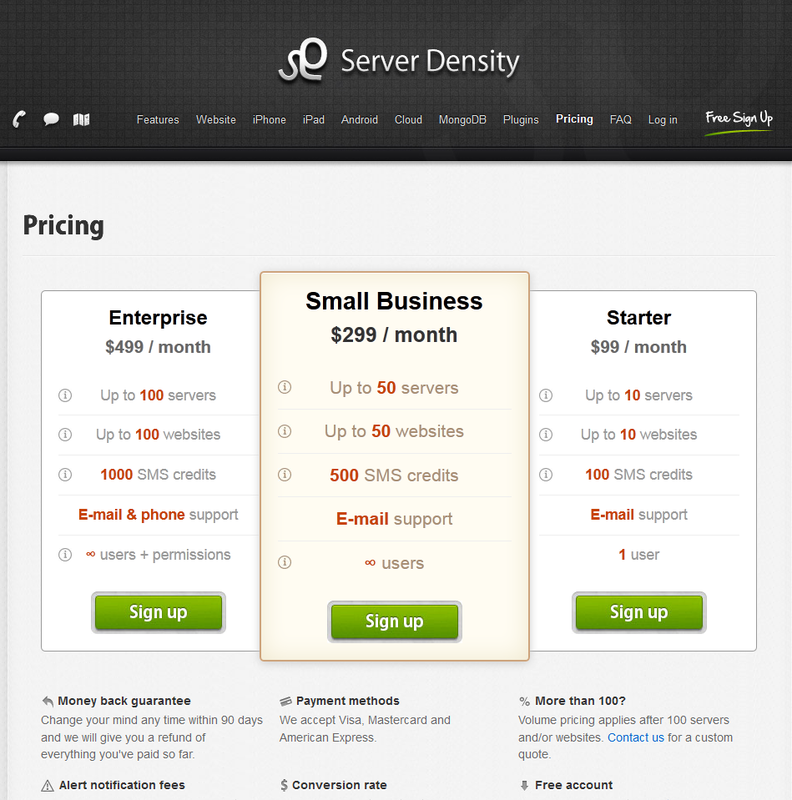 Server Density implemented an A/B test of the two pricing strategies using Visual Website Optimizer. At this point, there’s someone in the audience saying “That’s illegal!” That person is just plain wrong. There is no carbon in a water molecule, and price testing is not illegal. Anyhow, where were we? Oh yeah, making Server Density piles of money. They requested that I not disclose the interval the test was conducted over, to avoid anyone reasoning back to their e.g. top-line revenues, but were OK with publishing exact stats otherwise. At this point, variable pricing is clobbering the pricing plans (they get 25% less signups and pricing plans being inferior at maximizing trials has a confidence over 99%)… but let’s wait until this cohort reaches the end of the trial period, shall we? That’s a fairly similar attachment rate for credit cards. But collecting credit cards doesn’t actually keep the lights on — the important thing is how much you successfully charge them, and that is highly sensitive to the prices. +100% revenue (and revenue-per-visitor) for that cohort. Pretty cool. We Doubled Revenue?! Can We Trust That Result? Now, in the real world, SaaS customers’ value can change over time via plan upgrades and downgrades, and one would ideally collect many months of cohort analyses to see how things shook out. Unfortunately, in the equally real world which we actually live in, sometimes we have to reason from incomplete data. If you saw a win this dramatic in your business and were wondering whether you could “take your winnings” now by adopting the new pricing across all new accounts, I would suggest informing that decision with what you previously know about customer behavior vis-a-vis number of servers over time. My naive guess is that once a server goes into service it gets taken out of service quite rarely indeed and, as a consequence, most Server Density accounts probably have roughly static value and the few that change overwhelmingly go up. And what about the support load? Well, true to expectations, it has largely been from paid experts at larger companies, rather than from hobbyists complaining that they don’t get the moon and stars for their $13 a month. Dave was particularly impressed how many were happy to hop on a phone call to talk about requirements (which helps learn about the customer segments and develop the future development and marketing roadmaps) — meanwhile, the variable pricing customers largely a) don’t want to talk about things and b) need a password reset right now WTF is taking so long. Server Density expects that their plan customers will be much less aggravating to deal with in the future, but it is still early days yet and they don’t have firm numbers to back up that impression. Virtually no one gets pricing right on the first try. For more recommendations, again, you probably want to be on my mailing list. You’ll get an email today with a link to a 45 minute video about improving your app’s first run experience, the email about SaaS pricing tomorrow, and then an email about weekly or biweekly about topics you’ll find interesting. Server Density is not the only company telling me that those emails have really been worth people’s time, but if they don’t appeal to your taste, feel free to unsubscribe (or drop me an email to tell me what you’d rather read) at any time. Disclosure: Server Density is not a client, which is very convenient for me, because I’m not ordinarily at liberty to talk about doubling a client’s revenue. I’ve run software businesses for the last six years, all premised on the simple notion that if I provide value to customers they should pay me money. The actual implementation of translating their desire to pay into money in my bank account was less simple… until I found Stripe. They’re now up there with Twilio and Heroku in terms of “infrastructure companies which will totally change the way savvy software companies do business”, and if they ever get international processing nailed, I think they’ll probably take over the industry to Paypalian scales. Patrick notes: Hiya long-time blog readers. Last year I wrote two articles on career advice for young engineers, largely informed by conversations with a buddy of mine, Ramit Sethi.